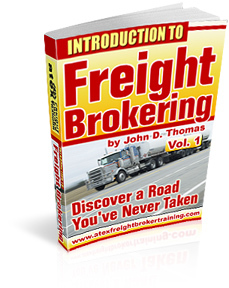 You will learn and apply new tools for doing business when you become a freight broker. You will want to master these new tools. Take, for example, the skill of "analysis" and using it as a tool to monitor and evaluate your progress. You will monitor and evaluate your shipper customers, your carriers and your lane activity. In our training, we go into depth on these skills and tools. For shippers, you will record, monitor and evaluate profit margins, accounts receivable collections and the number of loads you are getting, etc. For carriers, you will record, monitor and evaluate on-time pick-ups and deliveries, how well the driver follows instructions and driver communications, etc. For your lanes, you will record, monitor and evaluate how many trucks are available when and where you want them, what kinds of rates are you getting and what is the truck to load ratio, etc. You are doing more than moving cargo, you are a lean, mean analytic machine - we will show you how. If you want to go into this business, the skill of analysis is an extremely important tool that you must have. You must record lots of data, and you have to do this at an extremely fast rate, with moving cargo. If you don't have this skill set, and you don't feel like you could pick up on this skill set anytime soon, a freight broker maybe isn't the right job for you.